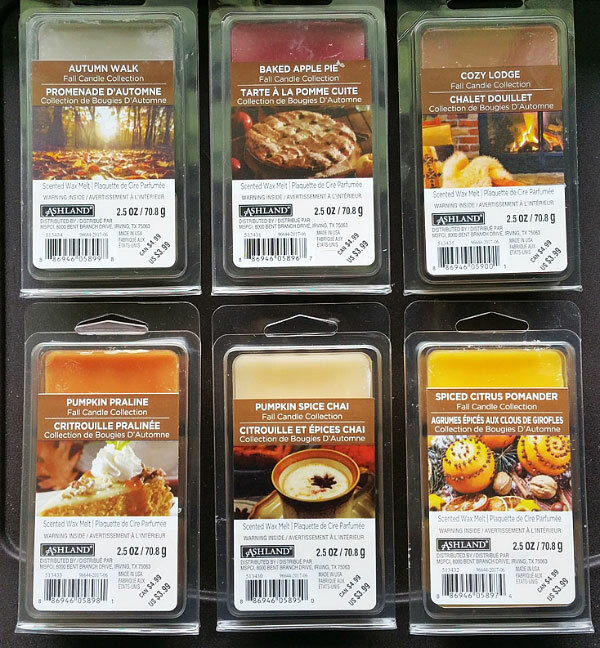 This is a review of Michaels (Ashland) Fall Wax Melts Reviews from 2017. Many of these are "typical" pumpkin and apple type fall scents. This smells like a men's cologne with a slight woodsy note, but not smoky. It's just an "okay" scent for me, as the cologne is a bit harsh. A nice sweet apple pie scent with a hint of cloves. It's nice, but a typical apple pie scent like a lot of others out there. A very nice sweet woodsy scent with an oud wood note (a dark, resinous, slightly treesappy woodsy scent). This smells like an expensive furniture store, and a lot like Better Homes and Gardens Pure White Woods. A super rich sweet milky caramel scent with an almond note and just a smidgen of pumpkin spices. This is quite similar to Mainstays Pecan Pumpkin Cake, except this scent has an almond note that the Mainstays scent does not have. I think this is going to be the most popular scent of the new Fall Candle Collection because it's so yummy! A sweet pumpkin pie scent with a hint of chai tea. I'm normally not a fan of pomander, which is generally a combination of orange and spices like clove. They often smell weird and soapy to me. But this one smells rather nice as it has more orange in it than most pomander scents I've smelled.